Study Guide below by popular demand. In the fifteenth century, Europeans began to sail all over the world. Because of conquests by the Ottoman Turks in the fourteenth century, Europeans could no longer travel by land to the East, like Marco Polo had done in the thirteenth century. This problem made them attempt to reach Asia by sea. They had three main motives for undertaking these dangerous voyages. The first motive was economic. Europeans hoped to find precious metals and to expand trade, especially for the spices of the East. The second motive was religious. Many Europeans believed that it was their duty to convert other peoples to Christianity. The third motive was a desire for glory and adventure. These three motives are sometimes referred to as “God, glory, and gold.” Not only did Europeans of the fifteenth century have motives for exploration, but they also had the means that they had not had before. By the second half of the fifteenth century, European monarchies had increased their power and their resources and were able to sponsor voyages. Europeans had also reached a level of technology that made the voyages possible. 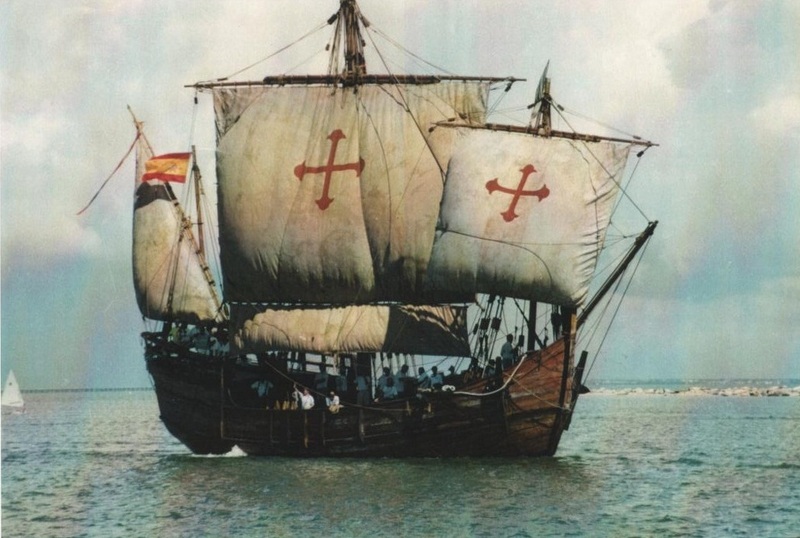 Beginning in 1420, Portuguese fleets began to explore the western coast of Africa. These fleets were sponsored by Prince Henry the Navigator. In Africa, the Portuguese discovered a new source of gold. The southern coast of West Africa became known to Europeans as the Gold Coast. Portuguese sea captains heard about a route to Indian around the southern tip of Africa. In 1488, Bartholomeu Dias rounded the tip, called the Cape of Good Hope. Later, Vasco da Gama went around the cape and cut across the Indian Ocean to the coast of India. There he took on a cargo of spices. After he returned to Portugal, he made a profit of several thousand percent. Portuguese fleets returned to the area to gain control of the spice trade, which had been controlled by the Muslims. In 1509, a Portuguese fleet defeated a fleet of Turkish and Indian ships off the coast of India. A year later, Admiral Afonso de Albuquerque set up a port at Goa, on the western coast of India. 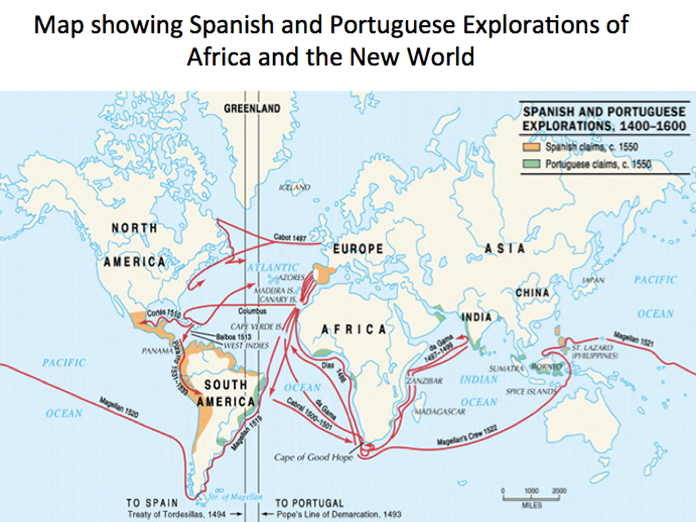 The Portuguese then began to search for the source of the spice trade. Albuquerque gained control of Melaka, which was a thriving port for the spice trade. From Melaka, the Portuguese made expeditions to China and the Spice Islands. They signed a treaty with a local ruler for the purchase and export of cloves. This treaty gave the Portuguese control of the spice trade. The Portuguese now had a trading empire, but they did not try to colonize the Asian regions. 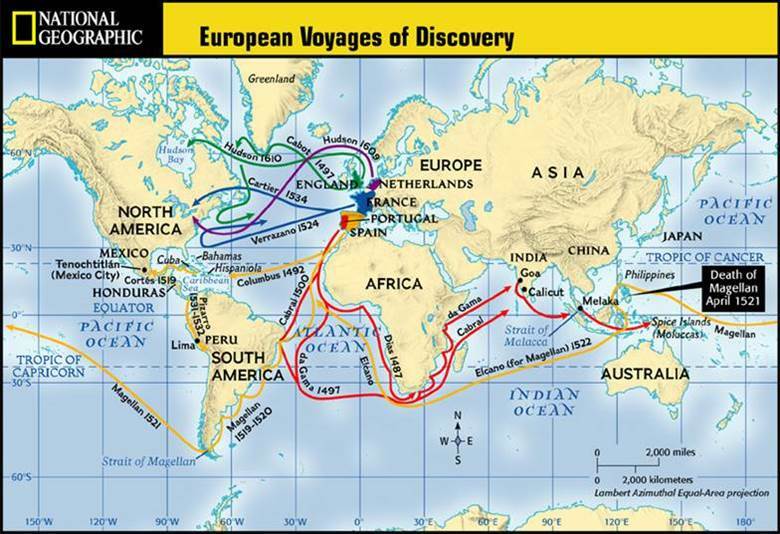 The Portuguese sailed eastward through the Indian Ocean to reach the source of the spice trade. The Spanish tried to reach it by sailing westward across the Atlantic Ocean. Christopher Columbus, an Italian, believed that he could reach Asia by sailing west, instead of east around Africa. He persuaded Queen Isabella of Spain to finance an expedition. In October 1492, he reached the Americas. He believed that he had reached Asia. He made three more voyages to try to find a route through the islands to the Asian mainland. In his four voyages, he reached all of the major islands of the Caribbean and Honduras in Central America. Still convinced that he was in Asia, he called the islands the Indies. By the 1490s, both Spain and Portugal had explored new lands. Both countries were afraid that the other might claim some of its newly discovered territories. In 1494, they signed the Treaty of Tordesillas. This treaty created a line of demarcation, an imaginary line that extended from north to south through the Atlantic Ocean and the easternmost part of South America. Unexplored territories east of the line would be controlled by Portugal. Those west of the line would be controlled by Spain. The treaty gave Portugal control over its route around Africa. It gave Spain rights to almost all of the Americas. The governments of many countries began to sponsor expeditions to the Americas. A Venetian seaman, John Cabot, explored the New England coastline for England. The Portuguese sea captain Pedro Cabral landed in South America in 1500. Amerigo Vespucci went along on several voyages and wrote letters describing what he saw. His letters led to the use of the name America for the new lands. Europeans called these lands the New World, but they were only new to the Europeans. They already had flourishing civilizations when the Europeans arrived. The Spanish conquerors of the Americas were known as conquistadors. Their weapons brought them incredible success. The forces of Hérnan Cortés took only three years to overthrow the Aztec Empire in Central America. By 1550, the Spanish had gained control of northern Mexico. In South America, an expedition led by Francisco Pizarro took control of the Inca Empire. The Portuguese took over Brazil, which fell on their side of the line of demarcation. By 1535, the Spanish had created a system of colonial administration in the Americas. Queen Isabella declared the Native Americans to be her subjects. She granted the Spanish settlers encomienda (the right to use Native Americans as laborers). Spanish settlers were supposed to protect Native Americans, but few did. Instead, they put them to work on sugar plantations and in gold and silver mines. Forced labor, starvation, and disease took a terrible toll on Native American lives. The native peoples had little resistance to European diseases, and 30 to 40 percent of them died from smallpox, measles, and typhus. In the early years of the conquest, Catholic missionaries converted and baptized hundreds of thousands of native peoples. Native American social and political structures were torn apart and replaced by European systems of religion, language, culture, and government. Wherever they went, Europeans searched for gold and silver. Gold, silver, sugar, dyes, cotton, vanilla, and hides soon flowed into Europe from the Americas. 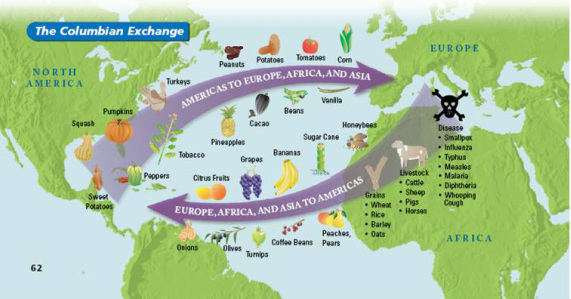 Agricultural products, such as potatoes, cocoa, corn, and tobacco, were also shipped to Europe. In turn, Europeans brought horses, cattle, wheat, and cane sugar to the Americas. Historians call this exchange of goods between Europe and the Americas the Columbian Exchange. By the end of the sixteenth century, several European countries were vying for the eastern trade. Ferdinand Magellan, a Portuguese explorer who was financed by the king of Spain, sailed around the tip of South America and crossed the Pacific Ocean to the Philippine Islands. The Spanish then established a colony in the Philippines. Spanish ships carried silver from Mexico to the Philippines and returned to Mexico with silk and other luxury goods. At the beginning of the seventeenth century, an English fleet landed on the northwestern coast of India and established trade relations with the people there. The first Dutch fleet arrived in India in 1595. Shortly after, the Dutch formed the East India Company and began competing with the English and the Portuguese. The Dutch also formed the West India Company to compete in the Americas. They established the Dutch colony of New Netherlands in the Hudson River valley. However, the English seized the colony of New Netherlands and renamed it New York. They also founded Virginia and the Massachusetts Bay Colony. By 1700, the English had established a colonial empire along the eastern seaboard of North America. The French were also interested in the Americas and colonized parts of what is now Canada and Louisiana. In the 1500s and 1600s, European nations established trading posts and colonies in the Americas and the East. A colony is a settlement of people living in a new territory, linked with the parent country by trade and direct government control. Colonies played a role in the theory of mercantilism, a set of principles that dominated economic thought in the seventeenth century. According to mercantilists, the prosperity of a nation depended on a large supply of bullion (gold and silver). To bring in gold and silver, nations tried to have a favorable balance of trade. The balance of trade is the difference in value between what a nation imports and what it exports over time. When the balance is favorable, the goods exported are of greater value than those imported. To encourage exports, governments stimulated export industries and trade. They granted subsidies, or payments, to new industries and improved transportation systems. They tried to keep foreign goods out of their own countries by placing high tariffs (taxes) on these goods. Colonies were important because they were sources of raw materials and were markets for finished goods. Slavery had been practiced in Africa since ancient times. The primary market for slaves was Southeast Asia, where most slaves were used as domestic servants. Slavery also existed in some European countries. The demand for slaves increased dramatically with the discovery of the Americas in the 1490s. During the sixteenth century, plantations (large agricultural estates) that grew sugar cane were set up in Brazil and on islands in the Caribbean. Growing sugar cane requires much labor. African slaves were shipped to Brazil and the Caribbean to work on the plantations. In 1518, a Spanish ship carried the first boatload of slaves directly from Africa to the Americas. During the next two centuries, the trade in slaves grew dramatically and became part of the triangular trade. In the triangular trade system, European ships carried manufactured goods, such as guns and cloth, to Africa, where they were traded for a cargo of slaves. The slaves were then shipped to the Americas and sold. 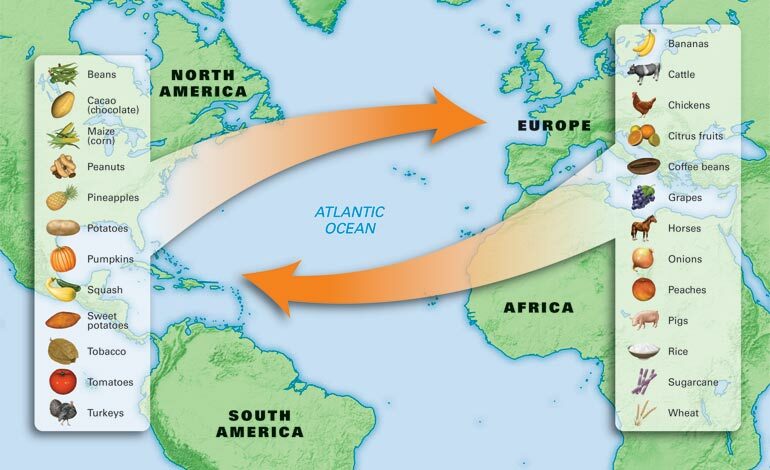 Europeans then bought tobacco, molasses, sugar, and raw cotton and shipped them back to Europe. As many as ten million African slaves were brought to the Americas between the early sixteenth and the late nineteenth centuries. 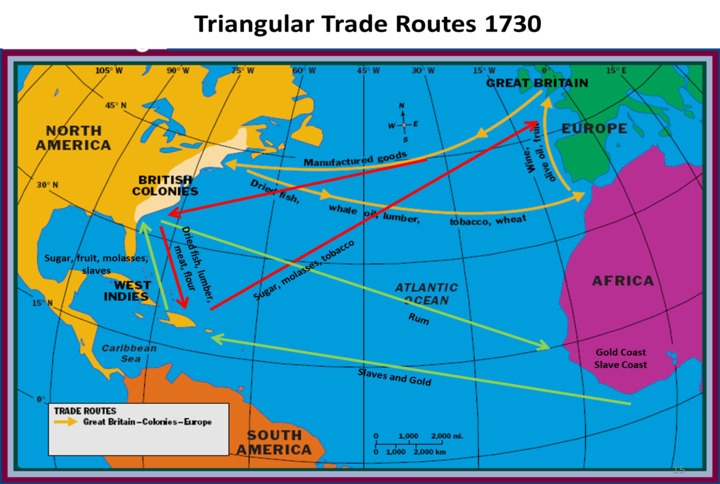 The journey from Africa to the Americas became known as the Middle Passage, the middle portion of the triangular trade route. Many slaves died on the journey. Those who arrived often died because they had little or no immunity to diseases. Before Europeans became involved in the slave trade, most slaves in Africa were prisoners of war. Slaves were sold at slave markets on the coasts. At first, African slave traders got their supplies of slaves from coastal areas nearby. As the demand for slaves increased, they began to move farther inland to find their victims. Many local rulers traded slaves. They viewed slaves as a source of income. Many sent raiders into defenseless villages in search of victims. Some local rulers became concerned about the impact of the slave trade on their societies, but their protests were generally ignored by Europeans and other Africans. The slave trade led to the depopulation of some areas. It also took the youngest and strongest men and women from many communities. The need to provide a constant supply of slaves led to increased warfare in Africa. Coastal leaders increased their raids on neighboring peoples. Of course, the slave trade always had tragic effects on the lives of individual victims and their families. The slave trade also had a devastating effect on some African states. In Benin, for example, the slave trade caused the population to decline and warfare to increase. As time went on, the people of Benin lost their faith in their gods, their art deteriorated, and human sacrifice became more common. Moroccan forces defeated the Songhai army and then occupied the city of Timbuktu. Eventually, the Moroccans were forced to leave, but Songhai was never the same. Foreigners also influenced African religious beliefs, but Europeans had less influence than the Islamic culture. In North Africa, Islam continued to expand. It also spread southward into the states of West Africa. The Portuguese engaged in some Christian missionary activity in Africa, but the English, Dutch and French did very little to spread the Christian message. The spread of Christianity was mainly limited to South Africa and Ethiopia. In 1500, mainland Southeast Asia was a relatively stable region. Kingdoms with their own ethnic, linguistic, and cultural characteristics were being formed. Conflicts eventually erupted among the emerging states. There was a bitter conflict between the Thai and the Burmese. In 1767, a Burmese army sacked the Thai capital. This forced the Thai to create a new capital at Bangkok, farther to the south. By the end of the fifteenth century, the Vietnamese had subdued the state of Champa and gradually took control of the Mekong delta from the Khmer. By 1800, the Khmer monarchy had virtually disappeared. In the Malay Peninsula and the Indonesian Archipelago, Muslim merchants in search of spices caused changes. New states arose along the trade route created by the Muslims. In the fifteenth century, the sultanate of Melaka became the leading power in the region. It owed its power to its location and to the rapid growth of the spice trade. In 1511, the Portuguese seized Melaka and soon occupied the Moluccas. The Moluccas were known to Europeans as the Spice Islands. They were the chief source of the spices that had attracted the Portuguese to the Indian Ocean. The Portuguese set up small settlements, which they used as trading posts. They did not have the resources to make colonies in the area. When English and Dutch traders arrived, things changed. In the early 1600s, the Dutch gradually pushed the Portuguese out of the spice trade. They took over most of the Portuguese forts along the trade route, including Melaka. The Dutch traders also drove the English traders out of the spice market. The English were left with a single port on the southern coast of Sumatra. The Dutch tried to dominate the clove trade by limiting the growing of cloves to one island. They also established a fort at Batavia on the island of Java in 1619. They gradually took control of the entire island. The arrival of Europeans had less impact on mainland Southeast Asia. The Portuguese had limited trade relations with several mainland states, including Thailand, Burma, and Vietnam. (Mainland states are states that are part of the continent, as distinguished from peninsulas or offshore islands.) These states had strong monarchies that resisted foreign intrusion. When other European nations began to compete for trade and missionary privileges in the area, the mainland states were able to unite and drive them out. In Vietnam, a civil war temporarily divided the country into two separate states. When the Europeans arrived in the mid-seventeenth century, they began to build trading posts and to take sides in Vietnamese politics. By the end of the seventeenth century, however, most of the trading posts were abandoned, when it became clear that the economic opportunities in this area were limited. French missionaries tried to stay, but their efforts were blocked by the Vietnamese authorities, who saw Catholicism as a threat to the prestige of the Vietnamese emperor. Religious beliefs changed in Southeast Asia during the period from 1500 to 1800. Islam and Christianity were beginning to attract converts, especially in the non-mainland states and the Philippines. Buddhism was advancing on the mainland. It became dominant from Burma to Vietnam. Traditional beliefs still survived, however, and influenced the new religions. The political systems in Southeast Asia evolved into four main styles of kingship: Buddhist kings, Javanese kings, Islamic sultans, and Vietnamese emperors. All of these styles adapted foreign models of government to local circumstances. The Buddhist style of kingship was the main form of government in Burma, Thailand, Laos, and Cambodia. In this style, the king was considered superior to other human beings. He served as a link between humans and the universe. The Javanese style was based on political traditions in India and was similar to the Buddhist system in many ways. Javanese kings were believed to have a sacred quality. They maintained the balance between the sacred and material worlds. The Islamic style was found on the Malay Peninsula and in the small states on the Indonesian Archipelago. In this style, the head of state was a sultan. He was viewed as a mortal, but with some special qualities. He defended the Islamic faith and staffed his bureaucracy (a body of non-elected government officials) mainly with aristocrats. In Vietnam, kingship followed the Chinese model. The Vietnamese emperor ruled according to the teachings of Confucius. He was seen as a mortal appointed by Heaven to rule because of his talent and virtue. He was also the intermediary between Heaven and Earth. Click here to complete QUESTIONS over the Amistad video clip.